Muscle actions are categorized as concentric, eccentric, or isometric depending on whether the muscle shortens, lengthens, or remains the same. The change in muscle length depends on the relationship between the strengths of the contractile force generated by the muscle and the resistant force of gravity and additional weight. Contractile force produced by the muscle is greater than resistant, gravitational force exerted by the weight. Contractile force produced by the muscle matches the resistant, gravitational forces so that the body stays in the same position. Concentric contraction by the biceps brachii during the raising phase of a bicep curl. The force produced by the muscle overcomes the resistant force of the weight due to gravity. Concentric contraction by the triceps brachii during the raising or extending phase of an overhead triceps extension. The force produced by the triceps to raise the weight above the head is greater than the downward gravitational force pulling on the weight. Eccentric contraction by the biceps brachii during the lowering phase of a bicep curl. The biceps produce less upward force to counter the gravitational force, resulting in the weight lowering in a slow and controlled manner. Eccentric contraction by the triceps brachii during the lowering phase of an overhead triceps extension. 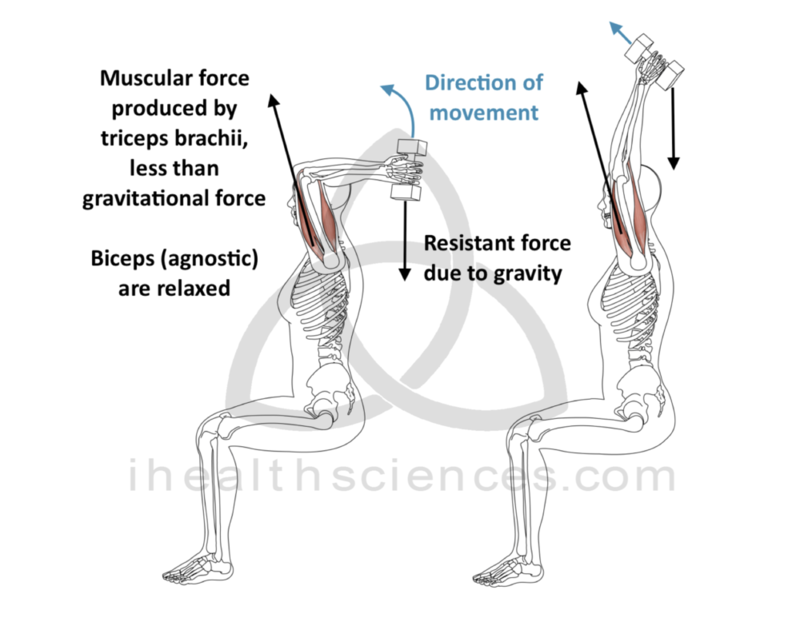 The triceps lower the weight in a slow and controlled manner by producing less upward force to resist the force of gravity from the weight. Isometric contraction by all of the involved muscles listed above during a plank. The muscles are producing an upward force that matches the downward force of gravity, allowing the body to hold the plank position.